Have you tried those gel manicures? I’ve started having my fingers done with the gel polish. I love it! My nails are getting stronger, and I’m enjoying the look of my nails without the damage of acrylic nails. 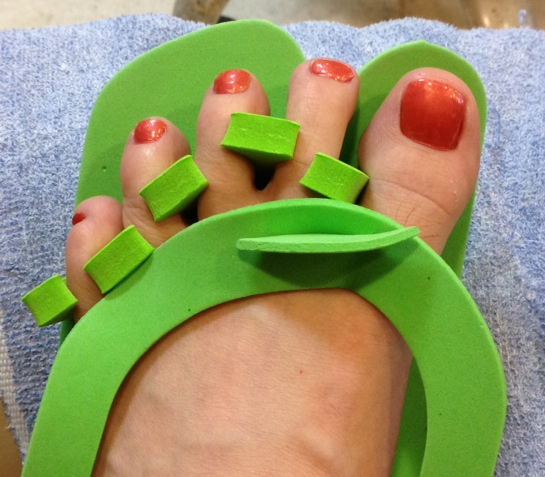 Even though I had a crazy-busy week before my Nidan test, I made time for a pedi! Since it was a big event, I got the fancy-schmancy flowers with bling. Like them? The photo isn’t the best, but hopefully you get the idea. This is OPI’s Purple with a Purpose. It’s a great spring/summer color – lots of purple color with some shimmer! This might be my go-to color this summer. We spent a week in Chicago visiting family and eating. 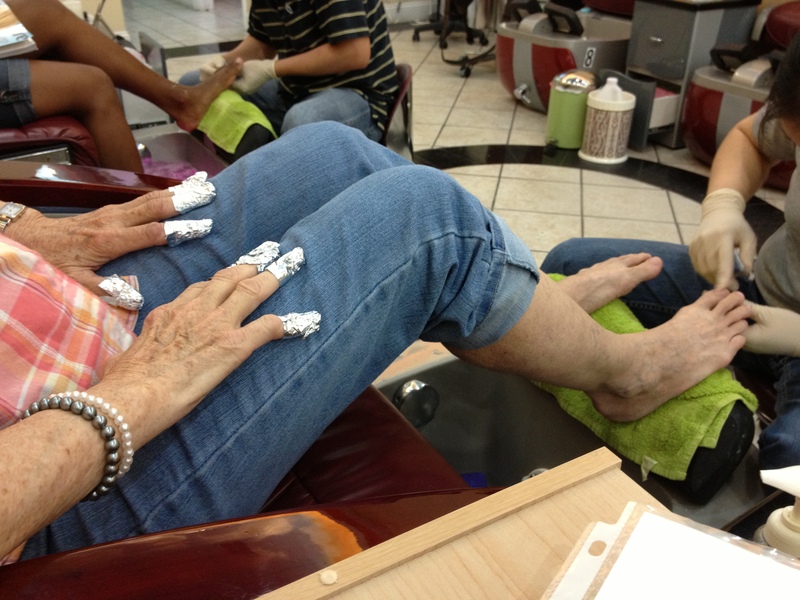 Mom and I took a couple hours to get our nails done. She got both a mani and pedi. I only got a pedi, because I’m doing some heavy-duty yard work here in KC. If I ever finish this yard work, I will get my fingers done too! When it comes to colors, sometimes I’m a copy cat. My college roommate recently got tangerine colored nails. Those sounded fun to me, so I got my own orange toes! This is Amy by Zoya. It’s the first time I’ve tried this brand, and so far I like it. They offered the orange in matte or sparkly. Of course I got the sparkles!! I’m trying to encourage Spring to appear with this week’s polish color, Hong Kong Sunrise by OPI. It’s been cold and miserable here, which is unusual for KC in the spring. Well, unusual on some days, not so much on others. In the Midwest, it’s said that if you don’t like the weather, stick around; it’ll change before you know it. I worked at home this morning to make sure the dog would be OK if there was thunder. I’ve had to Benadryl him twice in the last week; he shakes and drools when it thunders, poor guy! No storms today, but somehow I ended up working at home all day, and didn’t drive into the office for karate. I just wasn’t in the mood for the hour commute. So no workout today, but I think my time was well-spent at the nail salon. Now my toes are ready for this weekend’s USKK Elite Martial Arts Clinic. Bring on the training!! It surprises me how much better I feel after a pedi and fresh polish! I went about 6 weeks between pedis for various reasons. I tried to re-do the color myself, but the salon had used a magical top coat that I couldn’t get off. By the time I went in for a pedi, my nails were embarrassing, to say the least. Well, I’m embarrassed no more. 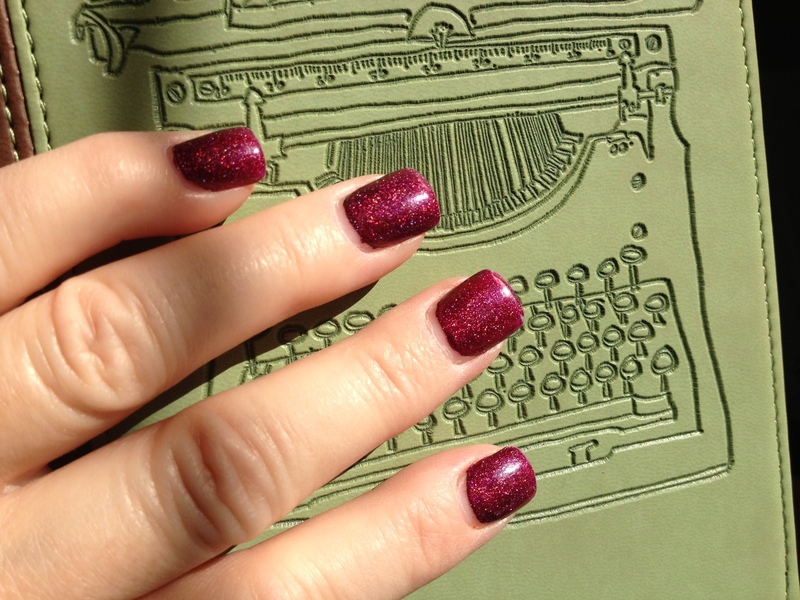 I got a pre-Christmas pedicure last Sunday, and chose this Royal Rajah Ruby. I love it! Of course I love most of my color choices, so maybe I don’t even need to say that. I think this is a great color for winter – not too ridiculously bright, but with enough color to chase away the clouds. Since it was about 30 degrees, the nail tech put these awesome socks on me before he painted my nails. They might be even better than my hospital socks! Did you trick-or-treat on Halloween? I did! But instead of trick-or-treating for candy, I trick-or-treated at the nail salon! I needed to avoid the trick-or-treaters in the neighborhood — not because I don’t like the little goblins, but because I have no willpower. 1 for the bumblebee, 1 for me. 1 for the fireman, 1 for me. 1 for the vampire, 1 for me. See how that works? NO WILLPOWER!! So like I said, instead of taunting myself with candies I shouldn’t eat, I skipped the store and got my nails done. This is Take the Stage by OPI. It’s a perfect fall color and has a nice glitz to it. Best thing about trick-or-treating for a pedi? It lasts much longer than a bag of candy! October is Breast Cancer Awareness Month. Our family was touched by this demon when we lost a friend / teacher / neighbor several years ago. My son is a HUGE supporter of breast cancer awareness efforts, and at one time our home office was painted pink. He converted me, a pink hater, into a pink lover and my wardrobe has never been the same! In honor of all the people who have been touched by breast cancer, I am wearing pink polish this month. Here I’m wearing Italian Love Affair by OPI, topped with a vinyl karateka kicking breast cancer’s booty! You can order the stickers from thefogshoppe on etsy. I don’t have the prettiest toes, do I? Maybe that’s a good thing – it lets the polish take center stage. Hahaha! 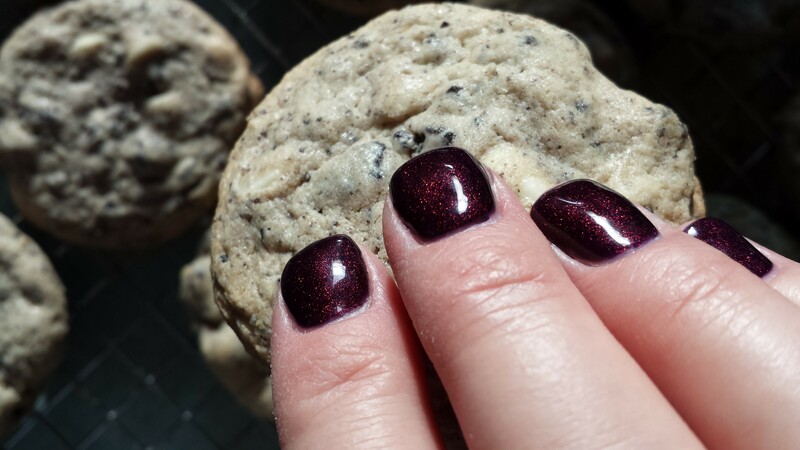 I love this reddish / purplish sparkly color! And how about my Kindle cover? Pretty awesome, considering I write and edit for a living. And I learned to type on my dad’s old black typewriter, that looked remarkably similar to this one. Good memories and great color! Looks like I’ve been on a red kick. Time for something else next time! My nail polish addiction goes way beyond keeping my toes fresh. I had acrylic nails long before I decided I could suffer through a pedi. When The Pretty One was younger he played competitive baseball and competitive golf all summer. I couldn’t find time for the salon, so when our travel schedule got too crazy, I would sit at baseball games and pick off my nails. When fall arrived, it was back to the nail salon for a new set. When I started karate I wasn’t sure I could work out with nails. Would I poke my partner in the eye? Scratch him? In the beginning, most karateka don’t have much control and I was no different. Last year I decided to give it a try and had acrylic nails put on. I don’t remember scratching anyone or poking them in the eyes; I think the only one I ever scratched or poked was myself! L: The nail tech’s idea of a fun design. R: My home re-do. There are tons of fun nail ideas on the internet now and I just couldn’t be left out, so off to the salon I went, hoping for a funky manicure. Unfortunately, my idea of a “fun” design and my nail tech’s idea were two different things! I watched as she put on more and more of a design I didn’t care for, knowing I would paint it over when I got home. As you can see from the picture, the designs are night and day apart! Personally, I like the red and black sponge job that I did much better than what the tech did. Next time I’ll have her paint the base coat and I’ll do the fancy-schmancy stuff after I get home! 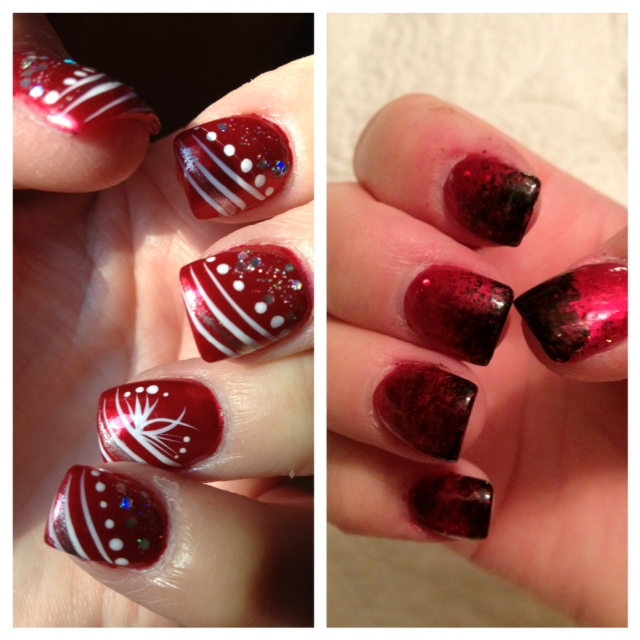 The red base coat is OPI’s An Affair in Red Square and the black sponged color is China Glaze’s Liquid Leather. I finally couldn’t stand my ugly, rough feet anymore, so I went for a pedi this evening. As I was testing the water and handing over my nail polish, I notified the nail tech that I didn’t want the massage portion of the pedi. I pointed out the knot on my calf from Shins of Steel Susana when we clashed in sparring. And the 3″ diameter bruise on my ankle that I thought was from sparring but have since decided is most likely a cracked bone just above the ankle. And reminded him that I have a big toe that no longer bends as much as I’d like. This is the same guy who told me I needed to be more careful kicking things, painted my nails before my black belt test, and did the previous pedi when my broken toe was healed enough to brave the manipulation, so that might explain why he didn’t look too surprised. My litany of injuries caused him to laugh and shake his head, even while he was telling me I needed to see the doc for the bruise. After reassuring him I have an appointment for x-rays tomorrow, he got to work. It was the most ginger / gentle pedi I’ve ever experienced! I felt sorry for the guy – he wasn’t sure how to hold my leg to smooth my feet because he was afraid to hurt me. Regardless, he did a great job, and my feet now feel “human” once again. Oh, the joy of freshly painted toes! Cruz deciding if she wants the same color on her nails. 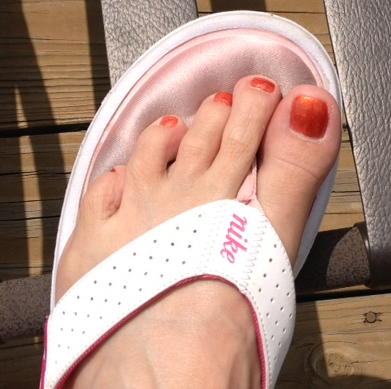 I love the color and think it’s perfect for late summer flip-flops! This is Coral Star by China Glaze. I recently purchased 3 bottles of China Glaze polish because they were on special. I figured I’d try the brand, even though I’m addicted to OPI. I have not been disappointed so far in the quality of the polish. If it holds up to my workouts (i.e., being dragged down to the floor in self-defense sets), my world of nail polish will be dangerously expanded. Finally – a New Pedi! Ten weeks after breaking my big toe, I finally felt comfortable enough for a professional pedi. I admit I was a bit nervous to let someone else touch my toe, but I did OK! I read a book and tried to pretend nobody was scrubbing, clipping, buffing and painting my nails. To be honest, I do that every time I get a pedicure! It seems like I’m either being tickled or hurt when they’re working on my toes. If I could make my feet look as good as a professional, I’d do it myself! But enough about that. I’m just happy I have fresh toes! I like deeper, more vibrant polish colors, so it’s surprising I even have this subtle color in my collection. Good thing, though because colors like this one are more forgiving of my messiness! The choice this time is Chocolate Shakespeare, a nice, mild brown that makes me want to run to the ice cream shop and get a chocolate milkshake! I think I did an OK job on my toes, but I’m crossing my fingers (and toes) that I’ll be able to sit through a professional pedicure soon! BTW, no idea what’s up with WordPress tonight – both this picture and the jujitsu toe pic are upright in my albums. Hmmm…. 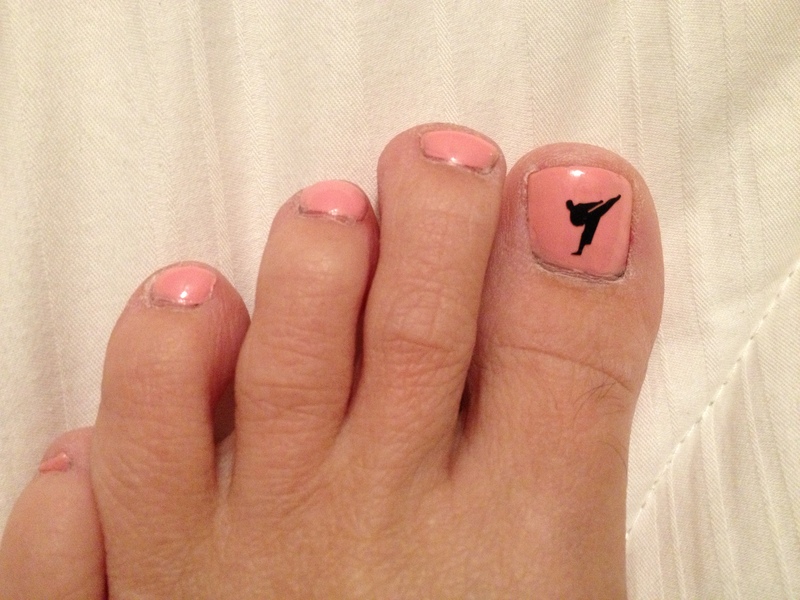 I didn’t find time for a full pedi before my black belt test, but I carved out time for a fun paint job. There was NO WAY I was lining up for such an important event with ugly nails! Fortunately for me, my nail guy was working that morning, and he doozie-upped my toes with an iridescent pink background, white flowers, green accents and a little *Bling. * What girl wouldn’t love these nails?!? The question came from my nail technician during today’s pedicure. Busted! Now there’s proof I’m kicking with my toes. I’ll try to be more careful in the future – careful not to leave any evidence of the crime of kicking incorrectly! Turns out I have two broken nails, and they’re both broken in the same spot. Kicking those shields is hazardous to my pedicure. After a little super glue for repairs and some Vodka & Caviar to hide the glue, the only people who will be seeing my less-than-perfect nails are the people who see my roundhouse up close and personal! 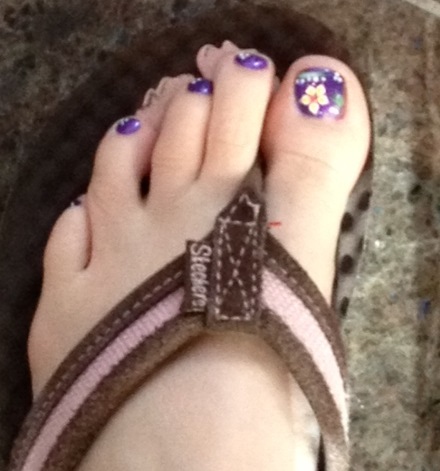 Purple toes add a little pop to February flip-flops! 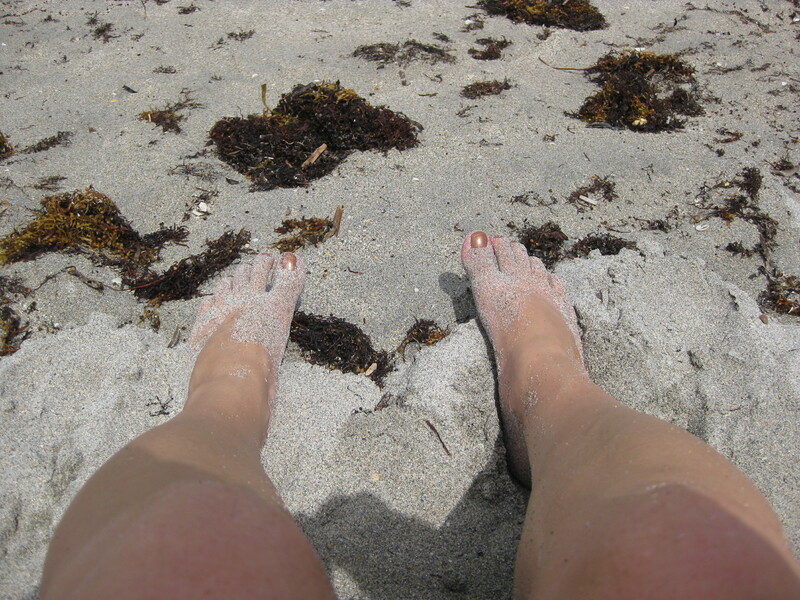 I wanted my toes in the ocean for my 50th birthday and there they are, in the Atlantic Ocean off the coast of Palm Beach, Florida! I had a wonderful 10-day trip last July — I stretched it out as long as I could by combining my birthday celebration / family visit with a karate clinic my Sensei flew down to teach. I enjoyed several days with Mom, The Pretty One (my son), my aunt and several cousins on the east coast, a too-short short visit with my college roommate across the state in Clearwater Beach, and a long weekend in Jacksonville for a karate clinic with Sensei and Peterbilt (one of the guys testing with me for Shodan). My 50th birthday celebration and the beach were more excuses than I needed to get my nails done! I chose You’re Such a Kabuki Queen and had cute little flowers painted just for fun. I think Sue, my roomie, has a nail polish obsession too, so I don’t think she’ll mind me sharing her toes with you. She’s wearing one of the crackle polishes. I haven’t tried those yet, but I like the way they look. I have pictures of The Pretty One’s feet in the sand, but I won’t embarrass him by posting them here. Besides, he doesn’t wear nail polish, so they’re really not that interesting. When Sensei sees us kicking with our toes, he asks if we have poison darts in them. Thought I’d help myself out for my brown belt test by making sure I DID have poison darts — just in case I forgot to pull back my toes! I’m not sure what color that is, but judging by the messy job, I must have done that myself. See why I go to the salon? I love being at the beach! This was taken at Hollywood Beach, FL. I have a sepia-toned photo of this hanging in my room, along with a couple of other beach pix. I thought the bronze tones wouldn’t show scuff marks from all the sand, and I was right. Or the top coat was good enough to protect the polish. Either way, my nails looked great, even with all the sand I wandered through that week.